Pre-Sold Out: Coming in May 2019 (details) Pre-Sold Out: estimated to ship in May 2019 (estimated date / subject to change). 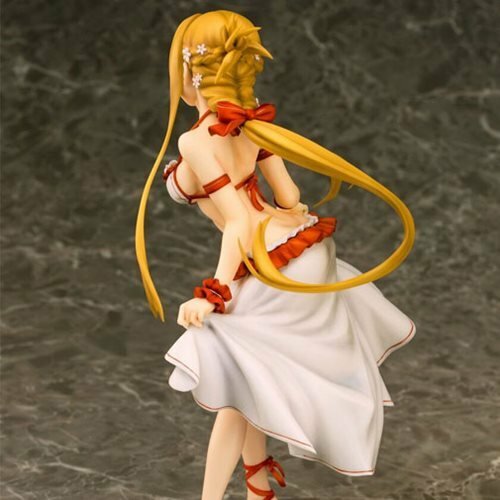 FromSword Art Online comes the Sword Art Online Asuna Swimwear Version Statue! Standing roughly 9-inches tall and made from ABS and PVC, the statue features a removable skirt. "I have been ordering from Entertainment Earth for some time and find their selection of items amazing. My den is filled with products from this outstanding company. I tell people that if you cannot find what you are looking for here, chances are you might not find it. The customer service is awesome. The staff are always ready to answer your questions or concerns. If I worked for this company I would likely want to be paid in product or spend my pay there. A great place to shop." "I have been ordering from Entertainment Earth for some time and find their selection of items amazing. My den is filled with products from this outstanding company. I tell people that if you cannot find what you are looking for here, chances are you..."